McGovern-Tracy Scholarship winner Karina Atwell, MD, with Ildi Martonffy, MD; Melissa Stiles, MD, with Brillman Leadership and Advocacy Scholarship winner Jennifer Perkins, MD. At the McGovern-Tracy Scholars and Student Awards ceremony, held April 30, 2014, the Department of Family Medicine (DFM) honored 27 medical students and family medicine residents for their commitment to community health, service and advocacy. 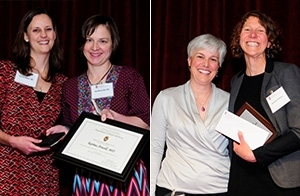 Learn more about the accomplishments of two award winners: DFM residency graduate Karina Atwell, MD, and UW School Medicine and Public Health (SMPH) graduate Jennifer Perkins, MD. Karina Atwell, MD, a McGovern-Tracy Scholarship recipient, is a 2014 graduate of the DFM’s Madison residency program. While a resident, she cared for a diverse and often underserved population at the Access Wingra Family Medical Center. In 2013, Dr. Atwell had an opportunity to explore community health initiatives in a village in rural Haiti. She decided to use extra elective time through the residency program’s Global Health Pathway to pursue those efforts. On her first trip to Haiti, she volunteered at a rural mountain clinic and surveyed the health needs of children at the nearby Fond Blanc orphanage. She was struck by the gravity of Haiti’s public health crisis; specifically, the shockingly high prevalence of malnutrition, disease, and disability. Back at home, Dr. Atwell began thinking about ways to develop sustainable medical care and malnutrition programs in the Fond Blanc community. She returned to Haiti in March of 2014 to begin developing a record system for children at the orphanage, organizing basic medical supplies and resources, and connecting with other organizations doing out outreach work there. Dr. Atwell’s next steps are to complete a Master of Public Health degree and residency in preventive medicine at the SMPH. She will also continue her work in Haiti, using the skills she gathers from those programs along the way. Jennifer Perkins, MD, a 2014 graduate of the UW School of Medicine and Public Health who received the Lester Brillman Leadership and Advocacy Scholarship, began her professional career as a massage therapist. She entered medicine intending to offer underserved populations integrated approaches to illness, but shifted priorities when she learned of the barriers many people face accessing basic care. Along with several classmates, Dr. Perkins established a local chapter of Students for a National Health Program—and fostered interest and leadership among her fellow students. She also worked closely with the Wisconsin chapter of Physicians for a National Health Program (PNHP), organized Wisconsin PNHP community events, and attended and presented at national PNHP meetings. During her fourth year, Dr. Perkins also led a student-run complementary medicine elective that introduces integrative medicine modalities, provides time for reflection, and offers self-care tools that students can take into residency. She was also inducted into the Gold Humanism Honor Society (GHHS), and with other GHHS classmates, held a successful interdisciplinary seminar maintaining compassion and empathy in medicine. Dr. Perkins now cares for patients at the UW Health Northeast Family Medical Center as a first-year resident in the DFM’s Madison residency program.